When entering Yellowstone National Park in winter you sense that you have crossed into another world, one of quiet softness hushed by a thick blanket of snow. Trees wreathed in frost loom like wraiths against the blue winter sky and towering waterfalls stand frozen in mid-plunge. 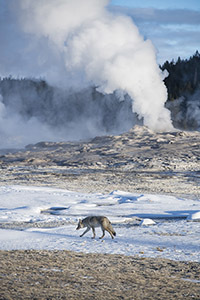 The crisp icy air enhances the ethereal effect of Yellowstone’s famous geothermal features. An exotic combination of mist-shrouded hot pools, bubbling paint pots, and steaming fumaroles creates an ever-shifting landscape of undulating clouds and mysterious shadows. It is an unearthly world of crystalline perfection. Seemingly deep in winter sleep, Yellowstone is alive with wildlife. Bison plow through deep snow in search of buried autumn-cured forage. Elk patrol the glistening white meadows and graze on grasses still green from the heat of nearby hot pools and bubbling springs. Numerous animals have emerged from the park’s backcountry to congregate in the warmer and more hospitable lowlands and river valleys. Bighorn sheep have come down from their lofty summer range for the promise of a milder winter climate in the foothills.